Welcome to ART + Academy! 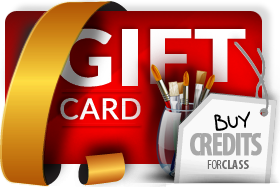 If you are looking for art classes, you’ve found it! We offer year-round drawing and painting classes for adults, teens (13-17 years old) and children (4 to 12 years old). During the Summer, we offer art camps for children from 5 to 17 years old. 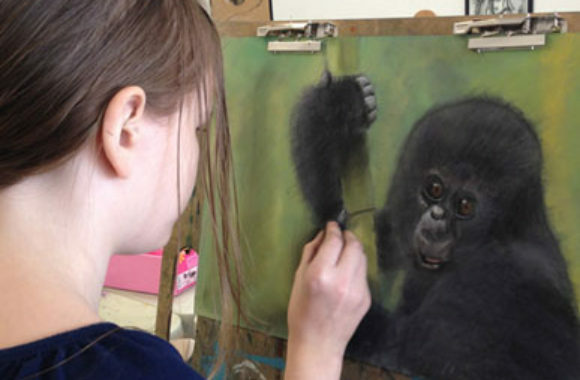 Our art classes meet on a weekly basis and their duration depends on the age of the student. We have three locations in the Greater Austin TX metro area: NW Austin, Cedar Park and SW Austin. Our philosophy is that small settings are the best way to teach art. Our small student-teacher ratio allows us to take each student from a beginner level to an intermediate or advanced level. At the same time, our small groups allow students to be inspired by others and learn how others apply the same concept they are learning into their work. As the student progresses, different media are introduced: pencil, charcoal, soft pastel, oil pastel, ink, watercolor, acrylic, collage and mixed media. The class curriculum is designed to ensure skill development, yet allow enough freedom to foster individual creativity. We are proud to be a locally owned business since 2009. At ART plus Academy, we believe drawing and painting are two important skills which support the creative and innovative thought process. Helping art students to learn how to "see" beyond the obvious, appreciate subtle differences in shade or color and dare to experiment are just a few examples of our passions. We provide ongoing art instruction from September to May on a monthly tuition basis. Our classes are small and organized by age groups. Because our groups are small, we can integrate new students throughout the school year. 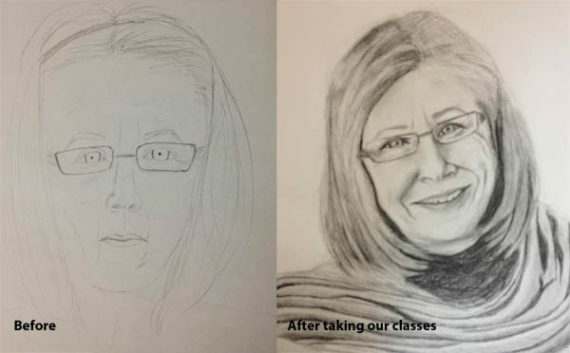 If you want to learn more about our drawing and painting classes, read about each age group class in the CLASSES tab. Anytime! Student registration is open year-round and classes are held continuously throughout the school year. Students may take four classes per month at their assigned day and time. Absolutely! You do not need to have any previous instruction or experience to come to Art+Academy. 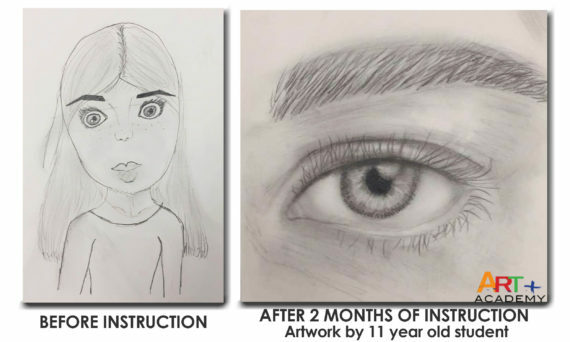 We will take you to the next skill level if you are a beginner who can only draw stick figures or an advanced student wanting to learn a new medium or technique. "Excellent teachers: organized, patient and well- informed. I had been looking for several years for a workshop of this type; this was exactly what I needed. 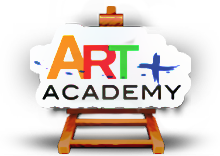 I recommend Art+Academy to anyone interested in advancing their skill level." "Art+Academy teachers are always pleasant, informative and very patient. They gently guide us in the right direction when we go astray. They have given me many tips to enhance my work and I will definitely take more instruction from them in the future." ART plus Academy is for all ages! 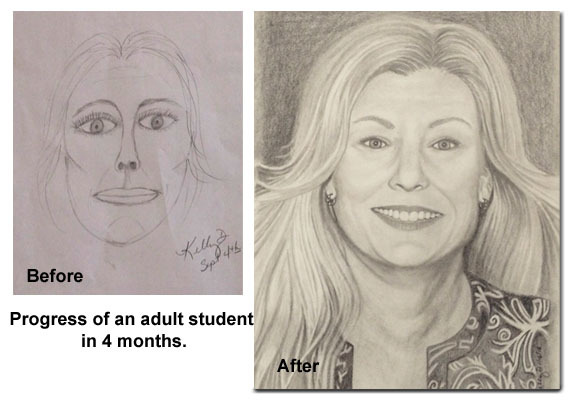 Learning how to draw is like learning to ride a bicycle and we can teach you! We have art classes from Monday through Saturday. We try to have an option in the mornings, afternoons and evening to cover the busy schedules. If you would like to see a class offered on another day or time, please let us know so we can consider your suggestion. WANT ADDITIONAL REASONS TO START? 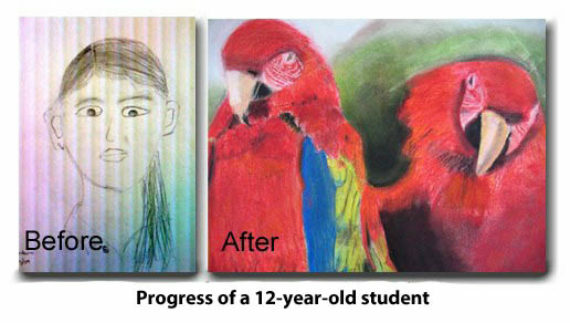 Drawing allows children, teens and adults alike to find a creative way to express themselves. It is a tool to develop and express ideas and a source of joy, confidence and self-esteem. “Creativity Enables Innovation” - read “STEAM and not STEM” whitepaper on why Art Education is a key to creativity.